RW: Why do you think these myths have been so entrenched throughout history? Stark: Because during the great religious wars, Protestant England and Holland put out a lot of anti-Catholic propaganda—I include a picture published in Holland in 1598 of a Spanish don feeding Indian children to his dogs. Unfortunately, this propaganda lived on, sustained by Protestant anti-Catholicism. Remember that English Catholics could not enroll in either Oxford or Cambridge until 1871. And, English historians shaped American history. RW: Anti-Catholicism has been called the last acceptable prejudice; do you think it continues today? Stark: Far less. But, the widespread credence given to Hitler’s pope charges, to the Crusades as Western colonialism instead of what they were, wars against Muslim colonialism, and to the rest of the false history I address causes good people to think there are good reasons to be anti-Catholic. 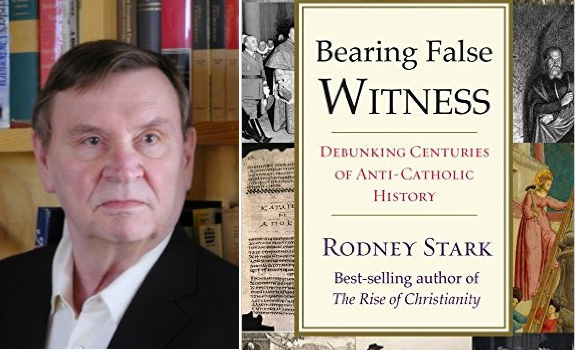 RW: In your conclusion, you note that anti-Catholicism has decreased significantly among Protestants, including Baptists, and cooperation and even a sense of unity has grown. What do you think that says about Protestants? Are theology and distinctive Protestant traditions just less important to them? Stark: One need not place any less importance on Protestant doctrines to disdain anti-Catholicism. Religious tolerance is a virtue, not a sign of irreligion.